Abyssal Plains - Abyssal plains develop far offshore in geologically stable areas of low sedimentation, well beyond the continental margins. These extensive, featureless regions of the deep ocean floor constitute Earth’s flattest surfaces. 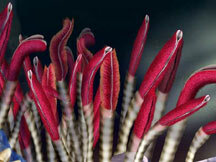 The abyssal plain is typically 4,000m deep and is the largest ecosystem on Earth. Amphipod – Small krill-like crustaceans that are part of the plankton. They are an important prey item for a number of animals such as fishes and whales. Atoll - An island formed from a coral reef, sometimes circular or horseshoe-shaped, with a lagoon in the center. Atolls usually form around sunken volcanoes. Aquaculture - The cultivation of aquatic organisms. Bank - A bank is a raised seafloor feature such as a large submerged plateau that is usually part of the continental shelf. Barrier Islands - Nearshore islands, most often occurring in a chain of long, thin islands that parallel the mainland coast and separate the mainland from the ocean. 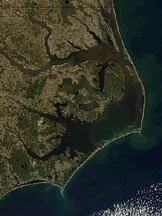 Barrier islands are built up by wind, waves, and ocean currents and protect the mainland cost from erosion and disastrous oceanic events such as hurricanes and tsunamis. Bathymetry - The topography of the ocean floor. Chemosynthesis – The conversion of carbon molecules into organic matter using chemicals as a source of energy instead of sunlight. For more information click here. Continental Shelves - The nearly horizontal platforms of thick sediment encircling the continents where the sea is relatively shallow compared with the open ocean. Continental Slopes - At their outer edges, the continental shelves descend abruptly along the continental slopes to the abyssal sea floor. Coral - An invertebrate animal with a calcium carbonate skeleton; related to the jellyfish and the sea anemone; as corals grow and die, they continue to overgrow their skeletons forming reefs. Crustacean – Aquatic animals with a hard external skeleton and segmented limbs belonging to the class Crustacea; includes krill, lobsters and crabs. Currents - The Earth’s winds are the driving force of its surface ocean currents which transport heat from the tropics to the higher latitudes, influence the location of major fisheries, and affect coastal climates. 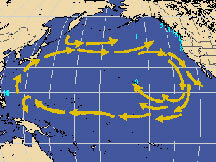 When a warm current such as the Kuroshio Current moves away from the equator and along eastern Asia, the water warms the coast and increases precipitation. A cool current, such as the California Current, which moves from Alaska back to the Equator along the west coast of North America it can moderate temperature extremes, resulting in drier, milder climates along the California coast. For more information, click here. 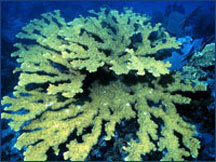 Ecosystem - A community of living organisms and its physical environment; for example, coral reefs or kelp forests. Eddy – Circularly flowing surface currents which often form as offshoots to larger directional currents. They can be 10’s of miles in diameter. Endemic – Native to the region and found no where else on earth. Exclusive Economic Zone (EEZ) - The area of sea up to 200 nautical miles from a country’s coast. The country has jurisdiction over the living marine, mineral and energy resources in its EEZ. For a more detailed explanation see economic importance. Global warming - The theory that the world's average temperature is increasing due to the burning of fossil fuels and other forms of energy resulting in higher atmospheric concentrations of gases such as carbon dioxide. GIS - Geographic information system, a computer program that allows one to visualize information in map formats. Gyre – Similar to eddies, gyres are typically much larger, often on the scale of entire ocean basins. Hot spots - Streams of molten rock arise deep inside the Earth and move upward through the crust to erupt on the surface or seafloor. As seafloor spreading moves the crust over these “hot spots” eruptions can create chains of seamounts and islands, such as the Hawaiian Islands. 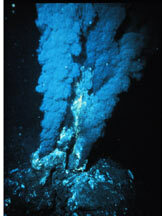 Hydrothermal vents - Openings in the ocean floor typically at or near a mid-ocean ridge release hot, mineral rich water that may support rare and unusual forms of life that derive their energy from chemo-synthetic sources. Long-lining - A method of fishing where baited hooks are hung from a long fishing line, often 40 miles long, to catch large fish such as swordfish, tuna, and mahi-mahi. Unfortunately, many sharks and endangered sea turtles and birds also get caught on the longlining gear. MPA - Marine Protected Area, an area of the sea that is protected from at least one preventable threat. Nautical mile - One nautical mile is 1,852 meters (6,076 feet). This measurement is used for maritime and aviation purposes. National marine sanctuaries - The National Marine Sanctuary System serves as the trustee for a system of 14 marine protected areas, encompassing more than 150,000 square miles. The system includes 13 National Marine Sanctuaries and the Northwestern Hawaiian Islands National Monument. Ocean currents - Regular movement of ocean water from one region of the ocean to another; for example, the North Pacific Gyre. Overfishing – When more fish are caught than is biologically or economically sustainable. Biological overfishing occurs when more fish are caught than the are replaced through reproduction. Economic overfishing occurs when more fish are caught than the maximum economic yield – the point where the greatest profit is made from fishing. For more information click here. Pelagic - Comes from the Greek word pelagos, meaning sea, and is an adjective describing things of or relating to the upper water column of the ocean. 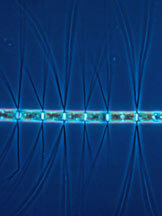 Phytoplankton - Minute, free-floating aquatic plants. Plankton - Minute, free-floating aquatic plants and animals. ROV – Remotely Operated Vehicle. An unmanned, highly maneuverable, submersible that can go on deep dives and collect data and video footage and is controlled by an operator aboard a ship at the surface. Typically the vehicle is tethered to the ship with a long cable. For more information, click here. Seamounts - Active or extinct underwater volcanoes rising at least 3,300 ft above the seafloor. Those that penetrate the surface become islands, such as the Hawaiian Islands . Submarine canyon - A steep-sided valley on the seafloor of the continental slope, generally found as extensions to large rivers, and have been found to extend 1 km (3,281 ft) below sea level, and extend for hundreds of kilometers. Submersible – A small submarine that can take one or more people underwater and is used for scientific purposes. Tectonic plates - Like pieces of a gigantic jigsaw puzzle, Earth’s crust is broken into tectonic plates that move. Their slow yet rough-and-tumble jostling causes earthquakes and volcanoes, and forges mountains, valleys, seamounts and deep-sea trenches. Trenches - Formed when dense oceanic crust slides beneath lighter oceanic crust or continental crust. The Mariana Trench, the deepest place on Earth, plunges nearly 6.8 miles (35,837 ft) beneath the Pacific’s surface. 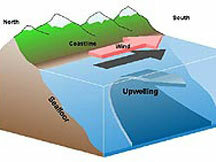 Upwelling – The process by which, dense, cold, deep, and nutrient-rich water is brought to the surface of the ocean. Upwelling often results in highly productive ecosystems. For more information click here. For a better understanding of the oceans, how the oceans influence you, and how you influence on the ocean, visit the ocean literacy website. 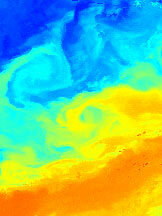 Eddies forming off the Gulf Stream.